The Colorado River, heading toward Utah. LOVELAND – Mike King, the new director of planning for Denver Water, said at a recent meeting that beyond additional transmountain diversions through the Moffatt Tunnel into an expanded Gross Reservoir near Boulder, Denver Water doesn’t have other Western Slope projects on its radar. King served as executive director of Colorado’s Department of Natural Resources from 2010 until January of this year, when he took the planning director job with Denver Water. “I think if we get Gross Reservoir approved, the answer is for the foreseeable future, you know, we need to do that first,” King said. King is a native of Montrose, son of a water attorney, and has a journalism degree from CU Boulder, a law degree from the University of Denver, a master’s in public administration from CU Denver and 23 years of state government experience. Denver Water is seeking federal approval to raise the dam that forms Gross Reservoir, in the mountains west of Boulder, by 131 feet. That would store an additional 77,000 acre-feet of water and bring the reservoir capacity to 118,811 acre-feet. Ruedi Reservoir, by comparison, holds 102,373 acre-feet. The $360 million project would provide 18,000 acre-feet of firm yield to Denver Water’s system and result in an additional 15,000 acre-feet of water being diverted from the West Slope each year. On average, Denver Water’s 1.3 million customers use about 125,000 acre-feet of West Slope water each year. The water to fill an expanded Gross Reservoir would mainly come from tributaries of the Fraser and Williams Fork rivers, via the Moffat Tunnel, near Winter Park. Beyond the Gross Reservoir project, King explained that any future Denver Water projects on the West Slope would need to fit within the confines of the Colorado River Cooperative Agreement, signed by Denver Water and 17 West Slope entities in 2013. 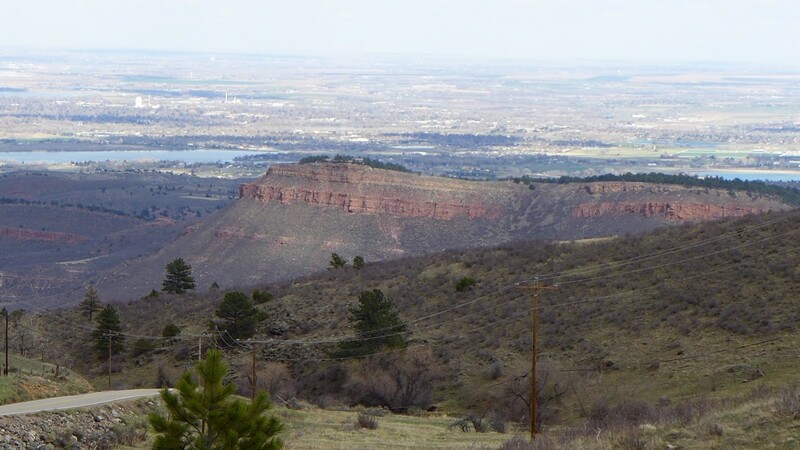 Not on Denver Water’s radar, perhaps, but it is worth noting that Denver Water is the only major Front Range water provider to have signed the cooperative agreement with the West Slope. Kuhn’s comment relates to the possibility that if Denver Water diverts too much water from the Western Slope, it could help trigger a compact call from the lower basin states, which could pinch Denver’s transmountain supply of water. Earlier in the meeting engineers from Northern Water — which supplies water to cities and farms from Broomfield to Fort Collins — told the mix of water providers and water users from northeastern Colorado that they could expect an average spring runoff this year, both from the South Platte and the Colorado Rivers. They were also told that Northern Water was making progress on its two biggest projects: the Windy Gap Firming Project, which includes construction of Chimney Hollow Reservoir near Berthoud; and NISP, the Northern Integrated Supply Project. 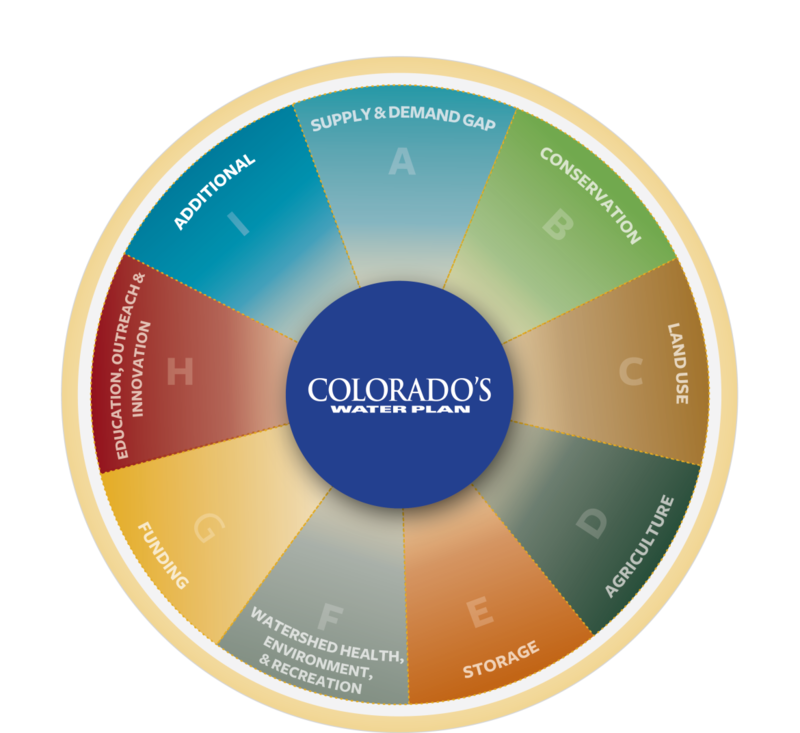 NISP includes two new reservoirs, Glade and Galeton, to be filled with East Slope water from the Cache La Poudre River, which runs through Fort Collins and into the South Platte River. Just before lunch, John Stulp, the special policy advisor on water to Gov. 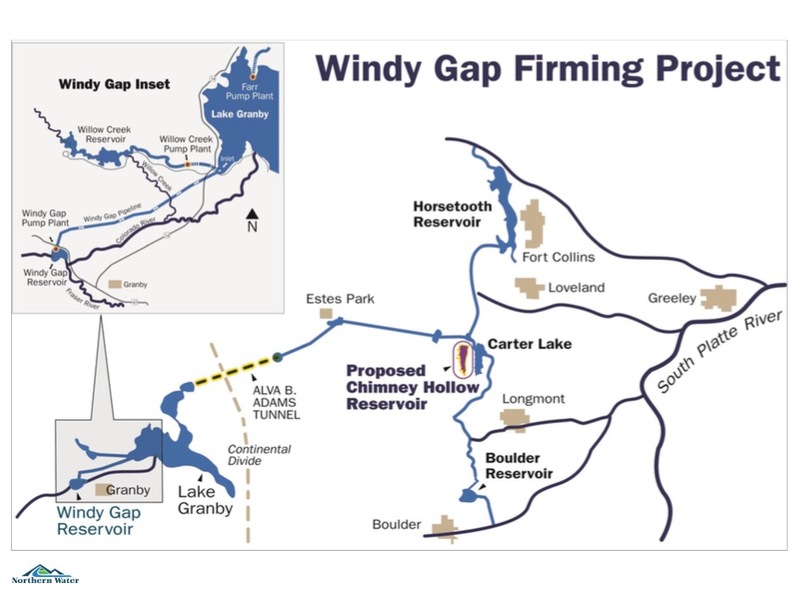 John Hickenlooper, read a surprise letter from the governor endorsing the Windy Gap project, which would divert an additional 9,000 acre-feet of water each year, on average, from the upper Colorado River and send it through a tunnel toward Chimney Hollow. Windy Gap is part of the Colorado-Big Thompson Project, which diverts on average 260,000 acre-feet a year from the Western Slope. 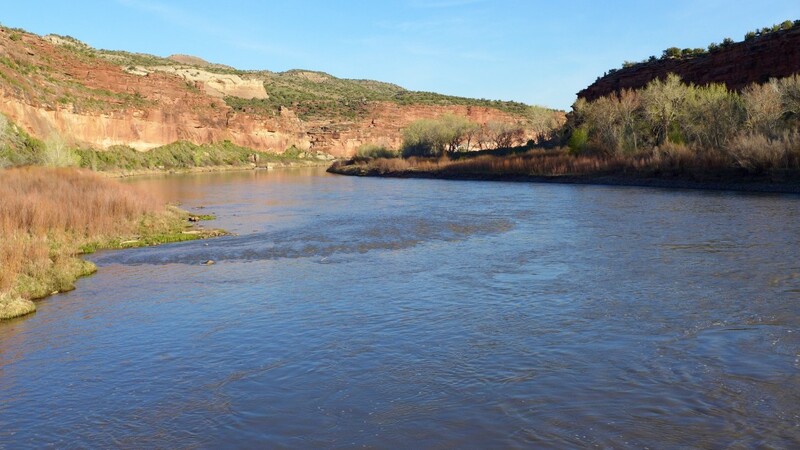 The Windy Gap project does include environmental mitigation measures for the sake of the Colorado River, and has approval from the required state agencies and Grand County, but it still needs a permit from the U.S. Army Corps of Engineers. After lunch, King shared some insights from his old job as head of the state’s department of natural resources. “I think it’s important that you understand what the development of the state water plan looked like from the governor’s perspective and the state’s perspective,” King told his audience. As head of DNR, King had oversight over the Colorado Water Conservation Board, which was specifically tasked by the governor in late 2013 to produce the state’s first-ever water plan, and to do so in just two years. “So the thing we had to make sure that came out of this, knowing that we weren’t going to solve the state’s water issues in two years, was that we had to do this in a manner that politically, this was viewed as a big win, and that future governors and future elected officials would say, ‘We need to do this again and we need to continue this discussion,’” King said. “Not because the governor needed a political win,” King added, “but because to have the next stage of the water plan, to have the discussion in five years, you can’t have an albatross around this, and I think we were able to do that, and so we’re very proud of that. King said the state was not able to “reconcile the inherent conflicts” in the various basin implementation plans, or BIPs, that were put together by regional basin roundtables as part of the water planning process. And he acknowledged that the plan has been criticized for not including a specific list of water projects supported by the state, and for reading more like a statement of problems and values than a working plan. King also said that there were some “tremendous successes” in the water plan, including the basin implantation plans, or BIPs, even though they sometimes conflicted. King said other successes in the Colorado Water Plan include the stated goal of conserving 400,000 acre-feet of water by 2050 and a nod to changing land use planning in Colorado. When it comes to land use and Denver Water, King said driving down the per capita use remained a high priority and that if Denver proper grows, it is going to grow up through taller buildings, not by sprawling outward. King also said Denver Water was working to manage, and plan for, the already apparent effects of climate change, especially as spring runoff is now coming earlier than it used to. “We know that the flows are coming earlier, we know that the runoff is coming earlier,” King said, noting that reality is causing Denver Water to plan for different scenarios and ask questions about storage and late summer deliveries of water. Editor’s note: Aspen Journalism, the Aspen Daily News and Coyote Gulch are collaborating on coverage of rivers and water. The Daily News published this story on Wednesday, April 20, 2016. And the Glenwood Springs Post Independent published the story on Saturday, April 23, 2016.
Who owns the water in Ruedi Reservoir?